Connect to PC experience with a single cable connection to the ASUS All-in-one Docking Station. Immediately connect to a wired network, multiple displays and your device with HDMI, RJ-45, and more USB ports. Place the compact dock on your desk with minimal impact to your work space. 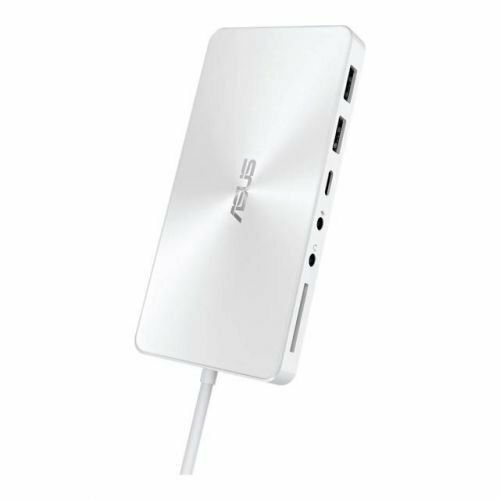 ASUS Universal Dock has multiple ports and connections for a wide variety of devices including an SD Card reader, network, displays (VGA and HDMI), as well as USB 3.0 and USB-C ports for ultra-fast data connections. Connect and transfer from many different devices separately or all at once. The compact and stylish design means ASUS Universal Dock fits neatly into any workspace, blending beautifully into any décor. It takes up very little space thanks to its miniscule dimensions, so it'll have minimal impact on your working area. ASUS Universal Dock allows you to use all your favorite accessories while you're on the go. It connects to a wired network and multiple displays, and features HDMI, RJ-45, and extra USB ports. It also provides a power pass-through that powers your device while it's charging. The compact and stylish ASUS Universal Dock fits neatly into any workspace.